Micro molded parts can be nano in size, but to produce fine features on larger parts can equally require the same level of competence as micro molding. 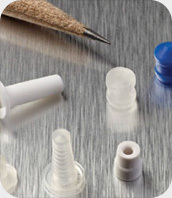 Medical components such as Catheters, Micro Sensors, Microfluidic slots and Bio-absorbable implants are perfect candidates for this micro process. All can be molded with microscopic proportions of a pellet. It produces geometries that can only be viewed through a microscope.